Winner of the BIC Giveaway! Labor day, for most families, mean Cookouts, get togethers, BBQs... whatever.... and it usually means that you are outside for hours at a time! Most of us are trying to soak up the last bit of summer before the weather starts cooling down! As you are preparing for your Labor day festivities don't forget the sunscreen! Seriously, don't forget the sunscreen!!! As parents, it's our responsibility to protect our children's skin. The burns they get now CAN and WILL affect them in the future. Coppertone has a great variety of sunscreen to meet the whole families needs! We got a great sampling of products to review, and trust me... they are going to come in handy! I have 3 boys with 3 different skin types. My oldest son has olive skin and dark brown hair. He almost never burns. My middle son is freckled and has red hair. He will burn within minutes of being outside. My youngest son is fair with blond hair. He doesn't burn as easily as my red head, but he will burn without protection much easier than most. Despite the difference in all 3 of their skin types, they all get sunscreen! I don't take chances. Available in 6 fl. oz. It's easy, it's quick and convenient! It's a win win! I always make sure to have this with us! Oil Free Faces Travel Size SPF 50 Sunscreen Lotion. Ladies, we are all worried about aging. The sun is incredibly damaging and will age you quickly. Also, this is one of those places where skin cancers can show up first. We often don't use sunscreen on our face because it can make sensitive skin break out. This is the perfect solution!!! Available in 8 fl. oz. I like to put a sunscreen lotion on the kids before we get out into the sun. Then, I try to maintain the protection with the spray. It's great for getting the face, ears and nose extra protected. It's frustrating when I try my best to keep the whole family from getting burnt only to realize that I didn't keep their ears protected enough and they have a painful burn on their ears. It's hard to get the spray on the ears, and the lotion is so messy and no one wants lotion in their ears. This is the perfect alternative! When I was about 12 years old my mother was diagnosed with Melanoma. Before then, I never knew that skin cancer can kill you. She was able to have surgery and her Melanoma was completely removed with clear margins. However, since then she has had more than I can count (on my fingers and toes twice over) of skin cancers removed from her body. It's disfiguring. It's scary. She lives every day worrying about the scary Melanoma beast coming back. In 2001 my Uncle, my Mom's brother, was diagnosed with stage 4 Melanoma. It was a terminal diagnosis. I think he lived about 6 weeks after he was diagnosed. Can you imagine? With our family history of melanoma, I take every precaution to protect us from skin cancer and Melanoma. Melanoma used to be something that older people worried about. Now, we have people in their 20's and 30's dying from this. There are even cases of teens dying from this very deadly form of skin cancer. I don't want to preach. Everyone has their own right to do whatever they want with their life and their skin. HOWEVER, I IMPLORE YOU to take care of your children's skin. It has been proven that the burns children get (even before the age of 10) can put them at a higher risk for skin cancer. Here are just a few links to stories of young people battling this disease. 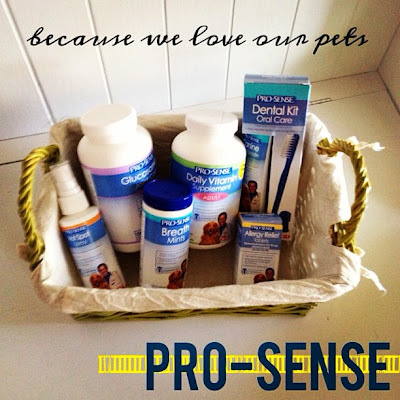 Pro-Sense -Taking the BEST care of our pets. Our pets are members of our family. We make sure our children take their vitamins, brush their teeth, and take any medicine needed to stay healthy... WHY would it be any different for our pets? It's hard to know what your pet needs and just where to get it. PRO-SENSE has expert information to help your pet stay in the best of health! Promotes bone and joint health in dogs. Your pets may be older and having trouble getting around. Just like humans, they get achy joints too! To make sure they have the best quality of life, it's essential to take care of their joints! This just makes sense. We take vitamins, why shouldn't our pets? It's always good to have this product on hand. You never know when you will need it. I don't know about your dog, but when my dogs get focused on a spot, they will scratch and lick it until it becomes a problem. No one likes their dog being in discomfort. This spray helps to relieve the itching and promote healing. There are times that our pets are more stressed. If we have a big crowd of people over, fireworks, thunderstorms, etc. I know our biggest problem with our Pups are thunderstorms. I think this product would keep us all sane if it could calm our pups down during the thunder storms. What wouldn't I do for these babies? Aren't they adorable?? **These opinions are my own. I received no money. I did receive free product for the puppies. 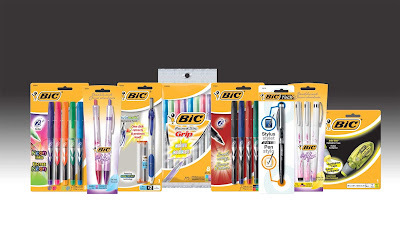 · BIC® Tech 2-in-1 Stylus and Pen – Our newest product that features a lightweight stylus on one end and a retractable ballpoint pen with smooth-writing Easy-Glide System® ink on the other! · BIC Brite Liner Highlighter Tape – This one-of-a-kind, fluorescent tape not only adds vibrant highlights without bleeding through paper, but is also erasable! 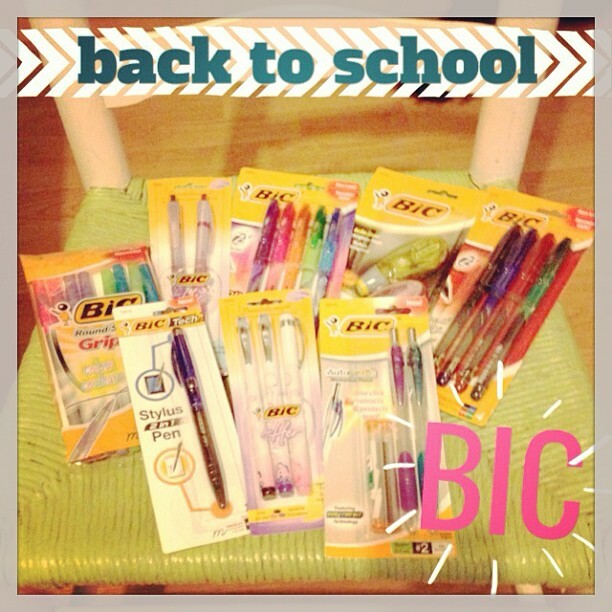 The boys and I got some goodies from BIC in the mail to review! Why is it that pens and highlighters excite me so much!? I have no idea, but my kids have inherited that gene! We felt like it was Christmas! BIC has generously let me host a GIVEAWAY for my readers!!! WANT TO WIN SOME BIC GOODIES FOR BACK TO SCHOOL!?? One winner will win the BACK TO SCHOOL LINE-UP PACKAGE! Just fill out this rafflecopter form! I will contact the winner when the contest is over!